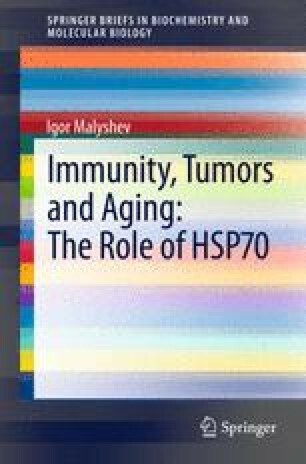 HSP70 s play important roles in immune responses. The specific physiological context substantially influences the immune functions of HSP70. The first factor is the localization of HSP70; whether it is intracellular, on the cell surface, or in circulation. Intracellular HSP70 protects the cell and restricts cytokine production, whereas extracellular HSP70 stimulates cytokine production and labels cells for destruction. The second factor is the type of receptors on the target cells that bind HSP70. Signaling receptors, such as the toll-like receptor (TLR), confer to HSP70 the ability to activate cytokine production and stimulate the innate response, whereas scavenger receptors help HSP70 to deliver antigens to antigen-presenting cells and therefore stimulate an adaptive response. The third factor is the circumstances of synthesis and release of HSP70 from the cell. For example, in the case of microbial invasion, HSP70 s are involved in the formation of antigen-dependent immune memory, and in the case of different stresses in the formation of antigen-independent immune memory.